Submitted 5 months 3 days ago by feeds_user. Military tactical backpack capacity approx.34L. Size approx. :11"*18"*12" / 28*45.5*30CM (W*H*D), it's small backpack; Military backpack is made of high density fabric-durable and water-resistant. 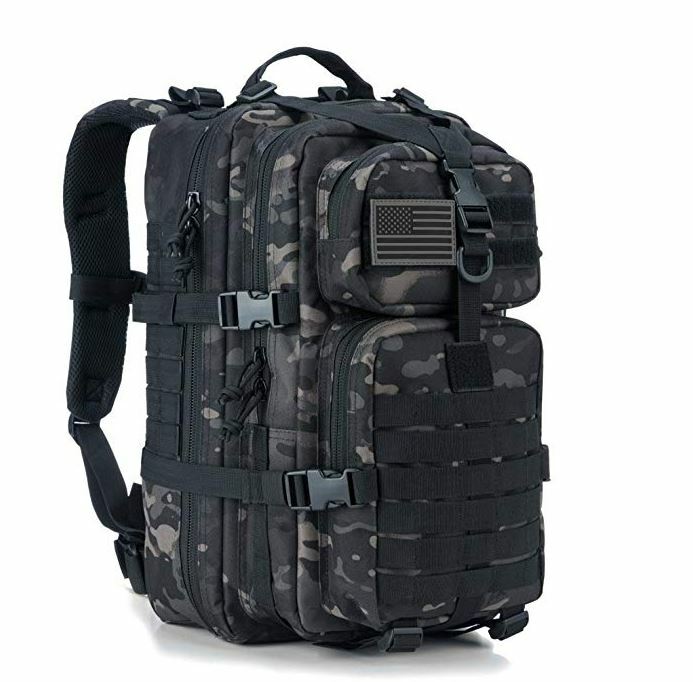 Tactical assault backpack with double-stitched, Heavy duty zippers and utility-style cord pulls, Side and front load compression system, Comfortable padding back area, Ventilated mesh padding shoulder strap. Military backpack has hydration compatible that works great for 2.5L hydration bladder (backpack didn't include hydration bladder) as hydration back pack or outdoor camping hiking backpack school backpack. Tactical assault pack can be used as small 3 day assault back pack, bug out bag backpack, combat backpack, range bag, hunting backpack, survival backpack, military army backpack rucksack or trekking backpack. Molle tactical backpack has molle system, MOLLE is a little different as most tactical bacpkacks and is not to spec. Spacing between of molle is less than 1/2".